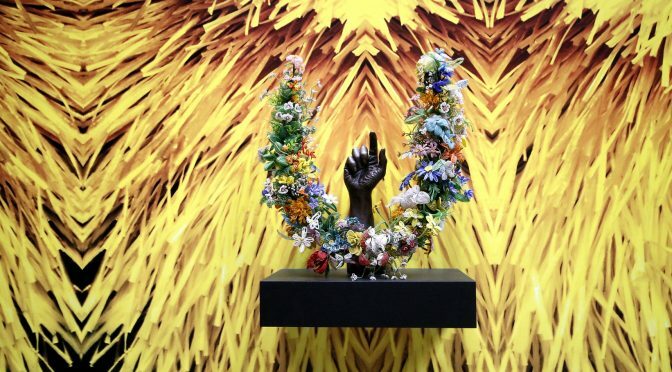 This is the most complex exhibition to date. It occupies almost the entire ground floor of Carriageworks. 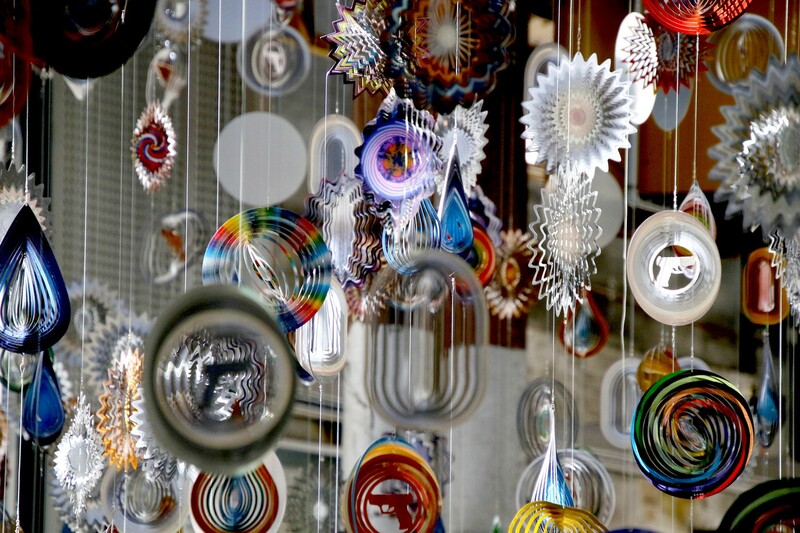 One enters a torrent of seemingly beautiful and glittering discs and other decorative objects all hanging from the ceiling. 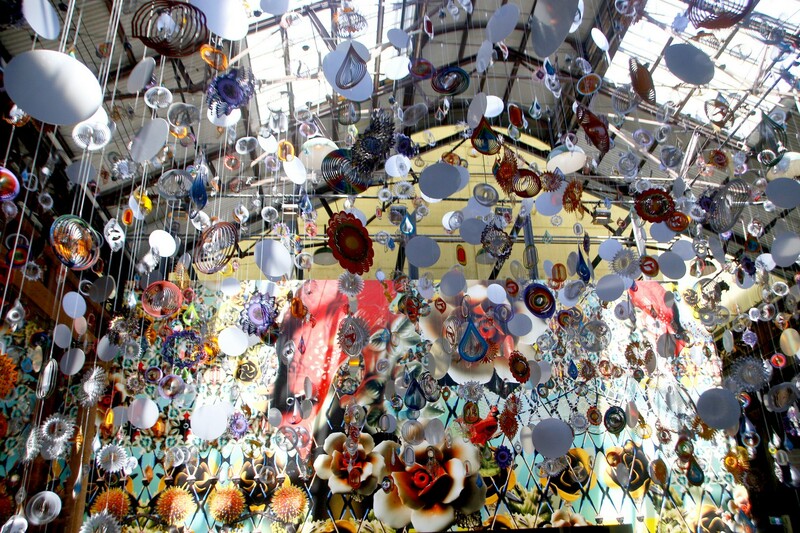 The work entitled The Kinetic Spinner Forest comprises 1800 hanging mobiles some of which on closer inspection have at their centre the shape of a teardrop, a bullet, or hand gun. The effect is both gorgeous and yet unsettling. 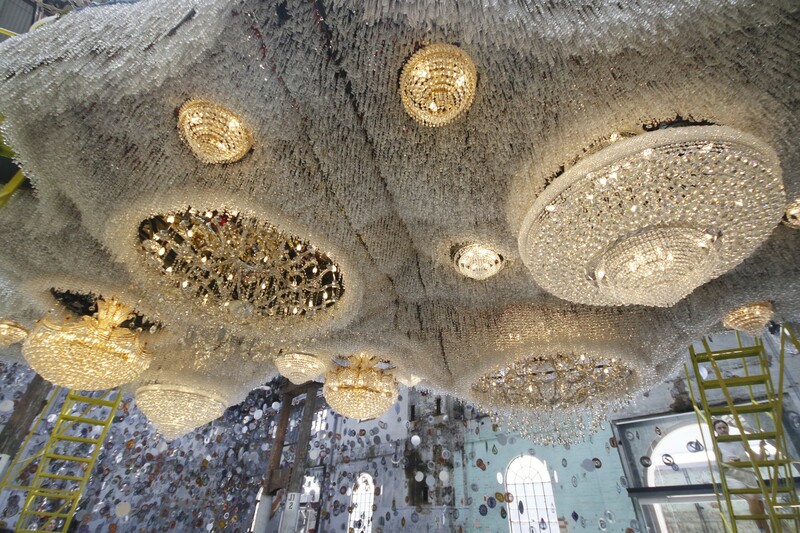 In the centre of the space is a canopy built of thousands of crystals and sparkling chandeliers which form the underside of a crystal cloud- in fact this work is entitled Crystal Cloudscape. 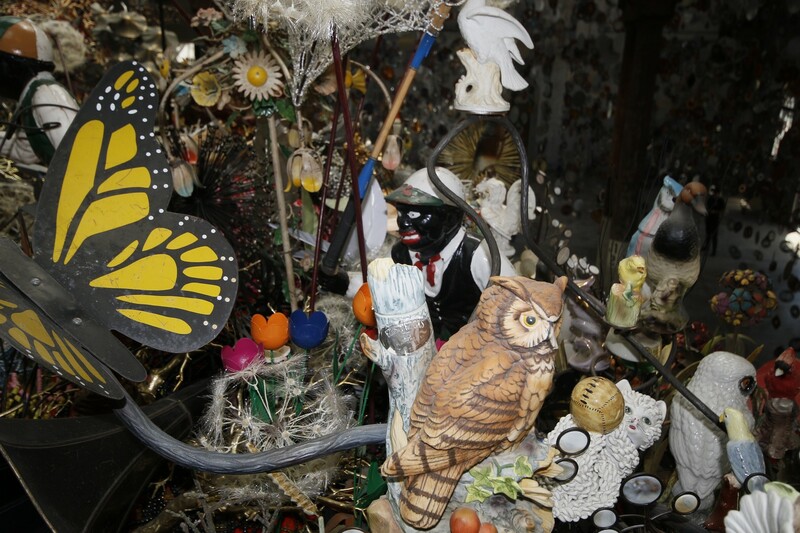 Upon climbing one of four ladders one is visually assaulted by bric-a-brac of objects which Cave has collected over the past decade. Amidst the porcelain birds, money boxes and ceramic salt and pepper shakers, soft toys, whiskey decanters are 17 cast iron jocko-style lawn jockeys. In Australia these would be the equivalent of Aboriginal garden gnomes which dotted suburban gardens until the later part of the Twentieth Century. These garden ornaments amidst beautiful objects have a bent posture implying servitude and exaggerated facial features reflecting a racist stereotype of an African American. It is believed that the lawn jockey is based on the folklore of Jocko Graves, an Afro American boy who served with George Washington during the American revolutionary war who was instructed to manage the horses and froze to death. On a side wall are beautiful paintings based on the objects in the crystal cloudscape. 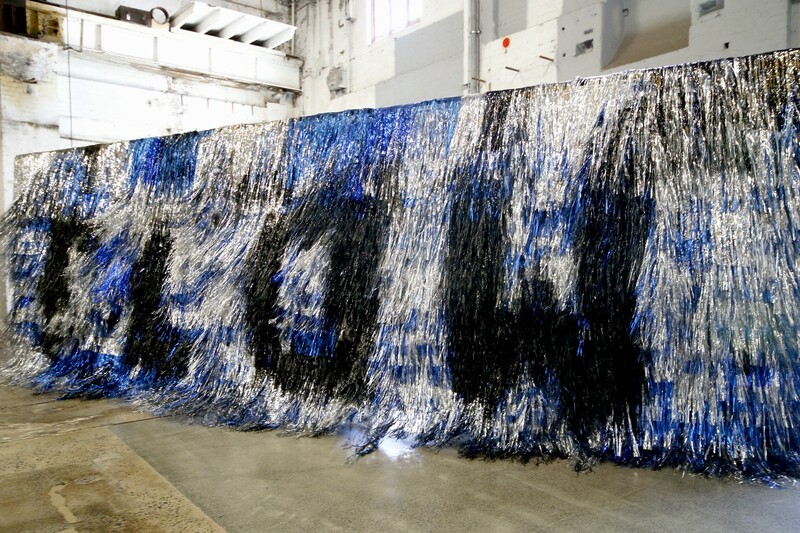 When one enters the next hall one feels a cool, refreshing breeze produced by a fan generated installation of metallic party streamers entitled ‘Flow-Blow’. Lining the two other walls of the exhibition are ten hand made and interwoven curtains that form ‘the beaded cliff wall’. 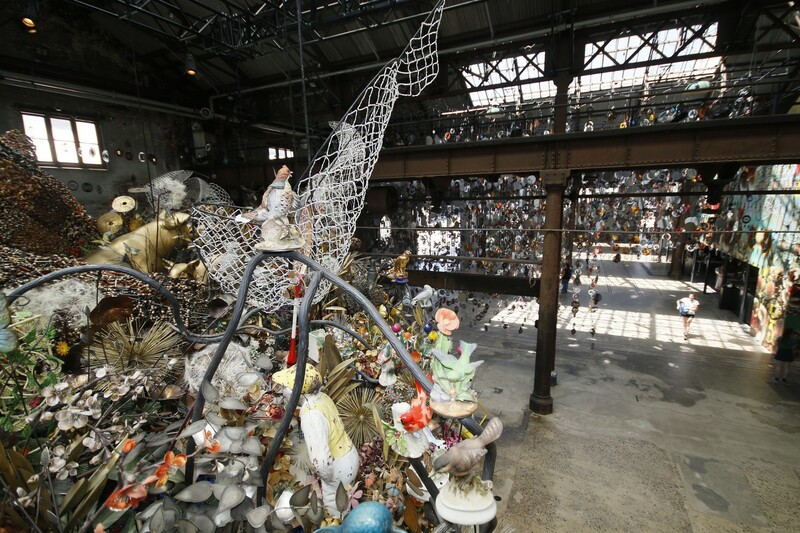 Constructed from millions of plastic hair pony beads strung on to shoe laces and woven over industrial cargo netting. 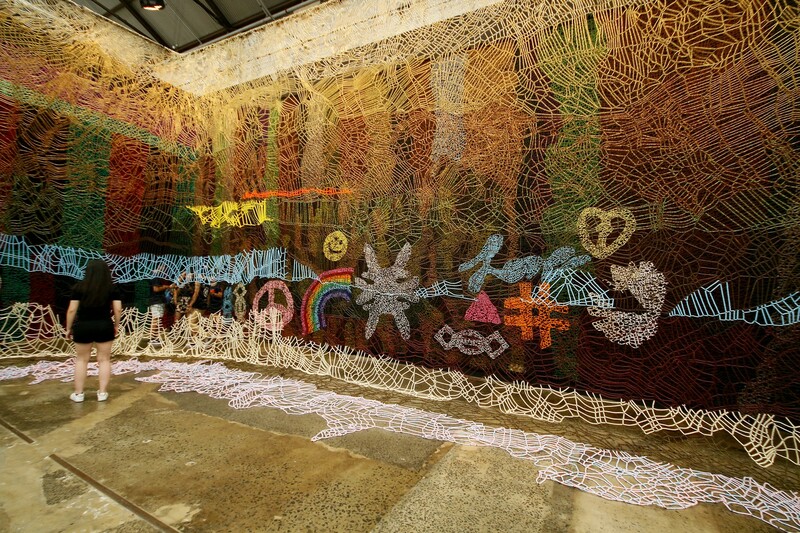 One can walk through this netting and experience this immersion as both a gorgeous textile installation yet again undercut by the words Power and symbols such as the peace sign, rainbow and pink triangle. This not to be missed exhibition runs until the 3rd March, 2019.